Tzav is a list of sacrifices, an explanation of many of the tasks of the priests. 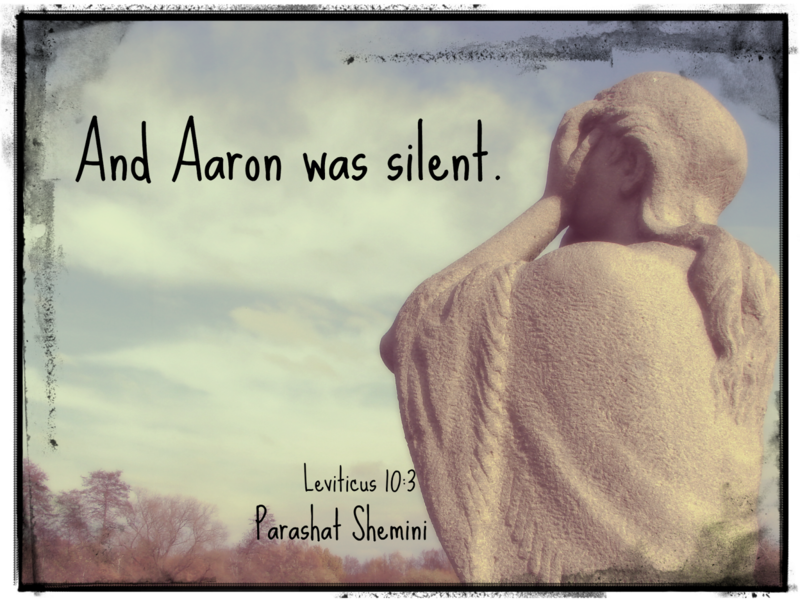 Delineated in this portion are the various ways that offerings are made on the altar, the mixing of the meal offering, and all of the rules that Aaron and his sons must follow to shepherd the people through these rituals. This Torah portion can feel very tedious. After all, it's a somewhat repetitive listing of tasks, punctuated by a recipe for a pancake. The priests' work is nothing but holiness. 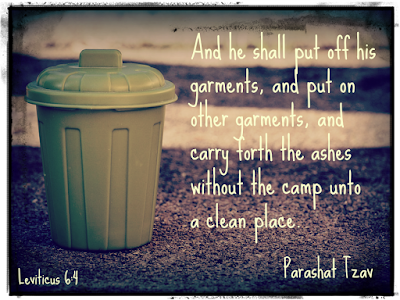 And yet, they are even instructed in the process of removing the ashes from the altar -- taking out the trash. Sometimes, that is what parenting is like: daily tasks, repeated over and over, punctuated by a meal that may or may not be eaten, and ending each day with taking out the trash. 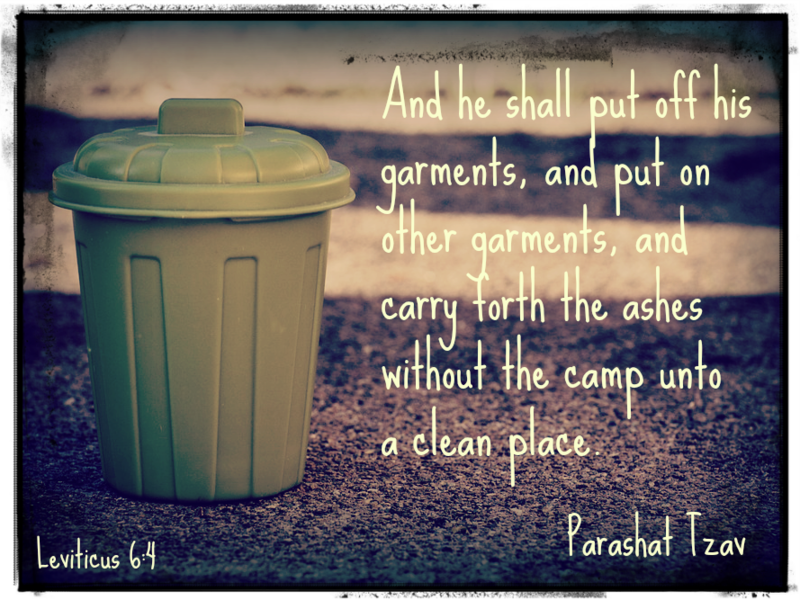 Somehow, it's hard to find that holiness in the ashes. Somehow, it's hard to figure out what exactly might be holy about making yet another lunch or doing yet another load of laundry or changing yet another set of bedsheets. Somehow, though, it's there. Not every day, or every time. But every so often...I'm reminded through the haze of it all...even the pancakes, the daily tasks, the trash....it's all holy. In our usual annual tradition, we have started to make a lot of hamantaschen. In the course of one baking session, we used one batch of Aunt Dora's dough, one batch of chocolate dough, and a double batch of cream-cheese dough (that's my favorite). It was about 150 cookies. Yum! The chocolate and cream-cheese recipes that I used this year came from Marcy Goldman's cookbook A Treasury of Jewish Baking. Hamantaschen are, as you might know, the three-cornered filled pastries that remind us in some way of The Bad Guy from the Purim story, Haman. Some say they are reminiscent of his hat, his pockets, or his ears. Either way, they're a fun and delicious treat for this holiday! So this year, I have started thinking more and more about what "counts" in the field of hamantaschen. After all, there's no list of "rules" for making them -- and over the last few years, perhaps thanks to Pinterest, hamantaschen creativity is off the charts! 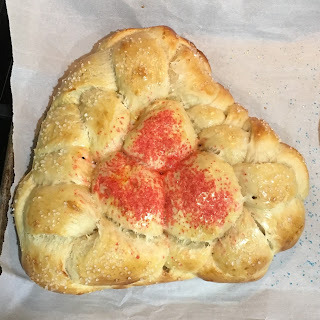 So this year, inspired by this post from Kosher in the Kitch, I decided to try my hand at hand-pie hamantaschen, also known as Pop-Tart Hamantaschen. I picked up a package of refrigerated pie dough (careful, some of the supermarket brands contain lard) and let it come to room temperature. Then I rolled them out into the round circles (meant to make pies of course) and sliced them like a pizza! I filled up half with chocolate spread and half with strawberry jam, crimped the edges, brushed with a little egg wash, and baked. Next time I will make them slightly smaller (it will make more from a batch of pie dough), and perhaps mix up the chocolate and strawberry! Luckily, challah doesn't mind dressing up as other baked goods. And if you don't like hamantaschen, try these Palmiers for Purim.